Whew, talk about a drama filled road trip. 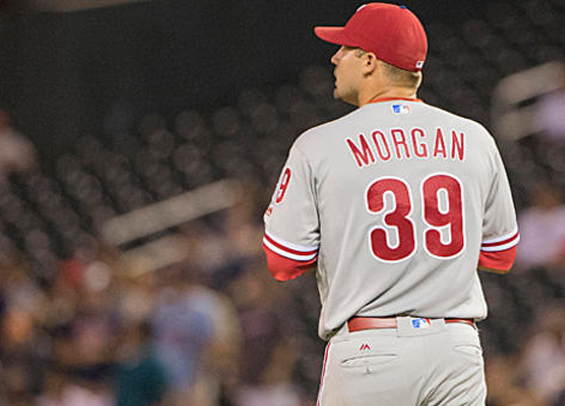 Dylan Cozens crushes a ball in the top of the ninth Wednesday in Chicago to give the Phillies a two-run lead, only to see Adam Morgan surrender a two-out walk-off grand slam in the bottom of the frame. The Phillies lost to the Cubs at Wrigley Field, 7-5. Seranthony Dominguez, who has been stellar since his call-up last month, began the final frame by walking Kyle Schwarber on four straight pitches. He then sat down Javier Baez to record the first out of the inning but then surrendered a single to Albert Almora before being lifted in favor of Adam Morgan. What appeared to be a victory hanging by a thread turned into a disaster as Morgan walked Ian Happ to load the bases. He then got Ben Zobrist to ground into a fielder's choice to notch the second out, but Jason Heyward had the final say, blasting a 2-2 fastball into the bleachers in right-center field to give the Cubs the win. Aaron Nola pitched well for the Phillies but struggled at times with his command. He surrendered three runs on four hits over six innings. He walked four and struck out six. The Phillies offense battled back after falling behind by three runs with a Aaron Alther three-run blast in the sixth, but struck out a combined 16 times and were 1-for-6 with runners in scoring position. The lone runs on the night coming via the long ball. It was a winnable game for the Phillies, the type a team eyeing to compete come September needs to win. The two clubs close out the three-game series Thursday afternoon with Nick Pivetta opposing Tyler Chatwood. For Pivetta, it'll be a chance to rid the taste from last week's lackluster start in San Francisco where he allowed three runs on five hits and lasted just four innings.